Astrologer Sue Hopper is a Pisces, the exaltation of Venus, but thanks to her sister, she has a great appreciation for the Venus-ruled air sign of Libra. She tells us that stylish, relationship-focused Libra is also cerebral, socially-oriented, and insists on balance and moderation. Libra represents the civilizing factor of society, symbolizing equilibrium and justice. And really, what could be more beautiful? Libra the fair, Libra the beautiful… What is it that makes lovely Libra so special? Famous Libras include luminaries such as Eleanor Roosevelt, Desmond Tutu, Mahatma Ghandi, Bob Geldof, and President Jimmy Carter… all examples of people who used every opportunity to make the world a more harmonious place. With Saturn currently transiting through its exaltation in Libra (2009–2012), this is a good time to look more closely at the sign so often associated with marriage and partnerships. Although Taurus and Libra are both ruled by Venus, the expression of Venus through Libra is very different from that of Taurus. When I think of Venus/Taurus, I think of earthly beauty. I envision former Victoria's Secret model Laetitia Casta, the voluptuous Face of France, who was born while the Sun was in Taurus. Fred Astaire and Barbra Streisand, both born with Sun in Taurus, also exemplify the harmonious, musical aspects that come with the physical, artistic side of Venus's influence. Earthy Venus is about sensuality and material luxuries, with none of that 'less is more' sensibility. In its most extreme form, I imagine Templeton the Rat from the children's book Charlotte's Web… focused almost entirely on experiencing self-oriented pleasure. In contrast, Venus expressed through the air sign of Libra is cerebral, socially oriented, and insists on balance and moderation. Libra represents the civilizing factor of society, symbolizing equilibrium and justice. And really, what could be more beautiful? My personal experience with Libra's influence began at birth. Eagerly awaiting my arrival was my Libran sister Maria, who was happy to trade her status from baby of the family to elder sibling. With rebel Uranus on the cusp of my ascendant, I may not have been what she or anyone else was expecting, but she heartily committed to her role as Big Sister anyway. The first and most obvious challenge I faced was strabismus, also known as being 'cross eyed'. This condition left me with double vision and very little depth perception or coordination, making me a very odd looking and clumsy child. I had sensory integration problems and would swing between being over stimulated and under stimulated, with moods that shifted unpredictably. Other children were put off by my crossed eyes and generally avoided me when they weren't overtly taunting me. By her own admission, Maria wasn't quite sure if I was going to turn out okay or not… but since I was hers, she spent hours playing with me and teaching me everything that she was learning in school. As a result of her tutelage, I was several years ahead academically and ended up being double promoted in grade school. While this was a good thing in many respects, it revealed a more subtle challenge I faced: difficulty in reading social cues and navigating social interactions. It is entirely possible that if I were a young child growing up now, I would be diagnosed with Asperger's Syndrome. But back in the early 1970's, I was just considered shy and overly sensitive. Through play and gentle guidance, Maria taught me how to interact in a wide range of social situations. She delighted in my Uranian originality and encouraged me to be myself in front of the appropriate audiences, so that I would not always feel stifled by the need to act properly. Libra is all about relationship, and the loving relationship between my sister and me gave me the start I needed to function well in society. It's not that my relationship with my parents wasn't important. It's just that my sister's Libran influence was the most critical factor in helping me to develop the social skills I needed to succeed as an adult. As we grew older, she often held up a mirror for me to see myself more clearly. Sometimes she did this to shake me out of selfish behavior, and sometimes it was because I needed to see the beauty inside of myself that I was afraid to recognize. 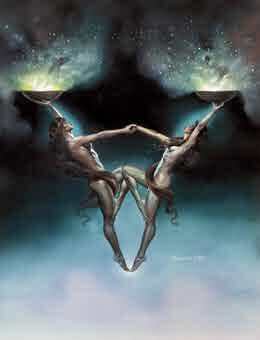 With Libra, it is always about balance, two sides to every story, and careful deliberation before taking action. It's worth noting that my sister had a Saturnian effect on me… she helped me to understand and navigate boundaries, rules, and the value of working steadily towards goals. It's no wonder Saturn is exalted in Libra, the sign that insists on fairness, justice, and social harmony. If you have a Libra in your life, you are lucky indeed!